We've all thought of death and asked if there was a possibility to live longer? The truth is, eventually it's a tragic fact of life we must all face at some point. Well, what if you could just keep transferring your consciousness to a new body, a younger body and be immortal through that type of path? 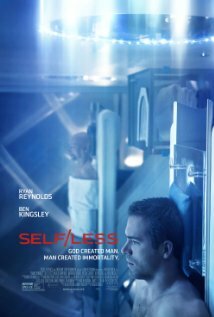 Selfless explains just that and falls under the category of a mystery and sci-fi flick and was a different movie I have been waiting to see. Selfless takes place in the present time we are right now and the introduction of such an experiment gets introduced to a dying old man dying from cancer. Not only is he old but rather wealthy and the thought of going young and starting new would be great so after much thought he decides to do it. Damian (Ben Kingsley) gets transferred into a younger body (Ryan Reynolds) and even though all is great, he has to start new. All of his old past connections must be forgotten for purposes of the company doing the procedure — it has to be top secret or else they will do anything to keep you quiet for its protection. The storyline for Selfless is great throughout, and when Damian starts getting old memories from the new body he is in, things turn for the worse and soon uncovers the bodies used for the procedure are not humans created in the lab after all. The trailers gives away what is going on so some of you know where the bodies come from but I'd rather you go see it. Selfless is great for sci-fi lovers but is not really worth seeing on the big screen. It's a mediocre movie and if you want to wait to Red Box it, I wouldn't blame you, even though it has a good storyline and a good ending. The acting was meh — some actors were better in other roles and some did great in this. What really had my attention and held me in my seat was where the story was going.